Summary: David Sedaris's beloved holiday collection is new again with six more pieces, including a never before published story. Along with such favorites as the diaries of a Macy's elf and the annals of two very competitive families, are Sedaris's tales of tardy trick-or-treaters ("Us and Them"); the difficulties of explaining the Easter Bunny to the French ("Jesus Shaves"); what to do when you've been locked out in a snowstorm ("Let It Snow"); the puzzling Christmas traditions of other nations ("Six to Eight Black Men"); what Halloween at the medical examiner's looks like ("The Monster Mash"); and a barnyard secret Santa scheme gone awry ("Cow and Turkey"). I have heard so many wonderful things about David Sedaris and his audio books that I finally decided to give one a try. A few weeks ago, I started listening to HOLIDAYS ON ICE in the mornings while I run -- yes, I know I'm a little early for the holidays but they will be here before you know it. I thought David Sedaris was hilarious and I was immediately hooked from the very first story. I have to be honest. I tried to read a Sedaris book many, many years ago and it just didn't work for me. Of course, I'm much older now (and wiser) so it's possible that my tastes have just changed; however, I think one of the reasons I liked this book so much is that I was able to listen to the stories. (In fact, I'm pretty sure that I wouldn't have enjoyed this book near as much if I had read it rather than listened to it.) David Sedaris narrates most of the stories, and I think he's a hoot. It's a given that his prose is hilarious, but I also think his presentation of the stories really brought this book to the next level for me. I think his voice and tone definitely provide some of the humor, but his timing is also pretty darn perfect! Usually when I read to books made up of different stories, there are some that I enjoy more than others. That was definitely the case of HOLIDAYS ON ICE, but I can't really say that any of the stories were dingers for me. I guess I'd have to say that I did enjoy the stories surrounding Christmas a bit more than the Halloween and Thanksgiving stories, but they were all entertaining in their own right. I especially loved the Christmas story about the Macy's elf -- I was laughing so hard at times that I could barely run. But I also thought the story about the competitive neighbors was hysterical too. It's hard to pick a favorite. I definitely recommend HOLIDAYS ON ICE. It's the perfect escape for this crazy time of year and I intend to revisit each holiday season from now on. I actually think this book might help me to keep things in perspective this year...we'll see! Thanks to the publisher for sending me HOLIDAYS ON ICE. I generally do not like it when authors attempt to read their own books but that does not count for comedians and humorists -- they bring that something extra to the experience. I'm going to have to try this one for my walks. I like Sedaris on audio books as he reads his own books. My favorite was Dress Your Family in Corduroy....hysterical. My daughter saw him perform live and said he was awesome. Oh, the only way to "do" a Sedaris book is to listen to him read it. I had no idea an updated version of this was available. I'll have to pick one up for a holiday treat! Sedaris reading his own work is the best! The story about the Macy's elf is based on his own experience. It was definitely my favorite in that book! Great review! I agree with Beth, I usually don't like authors as narrators, but David Sedaris does a wonderful job! I love Holiday on Ice. I usually start reading it right after Halloween, because my sisters and I joke once Halloween is over the year might as well be it all goes by so fast. I've never listened to Holiday on Ice but I keep meaning too. I make me want to go right out and get the audiobook. Thanks. I've listened to two of Sedaris' audiobooks and just started a third (Dress Your Family in Courdoroy and Denim) and I second your opinion...his stories must be listened to! Not all the stories make me laugh out loud, but most of them do. Anyway, I decided that today was a good day for laughing so I'm off to listen! 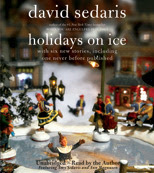 I have never read a bad word about Sedaris, but oddly, I have never read him either! But I want to get audio versions and this holiday collection sounds perfect! I've said it before and I'll say it again - David Sedaris is one of very few writers who I think needs to be heard on audio to be fully appreciated. I tried reading him in print and it was funny but not hilarious. Then I listened to an audio and it was hilarious! I went back to the print book I'd been reading and found I'd missed half the jokes without his inflections and funny voice! So glad you enjoyed it. I think Naked is his best book but Me Talk Pretty is a close second. I think I have this....or the older one. It sits on my coffee table during the holidays...Geez...how dumb am I? I'm going home to put up my Halloween stuff and get out the holiday books. I agree - David Sedaris's books are 100 times funnier when he reads them. I saw him live a couple of years ago and don't think I've ever laughed as hard as I did then. I haven't read Sedaris yet, but am convinced I need to start with his audios.